Following a recommendation from staff to purchase 10 fully electric buses from a U.S. subsidiary of a China-based motor firm, Long Beach Transit’s Board of Directors are conducting a second study session in as many weeks in order to obtain more information before it moves forward with voting to allow the company to head its Electric Bus Project. BYD Motors—a new U.S. subsidiary of the Chinese firm BYD Company Ltd.—was chosen over South Carolina-based Proterra as transit staff’s recommendation for the recepient of the Department of Transportation’s Transit Investments for Greenhouse Gas and Energy Reduction (TIGGER) grant which was awarded to LBT last year. According to the initial recommendation on February 25, LBT said BYD had already deployed several buses within the U.S.—particularly to Apple in Cupertino and Hertz in Los Angeles—as well as Europe. However, the Long Beach Post has independently verified statements from several Apple and Hertz executives that say the claims BYD presented to LBT are false. 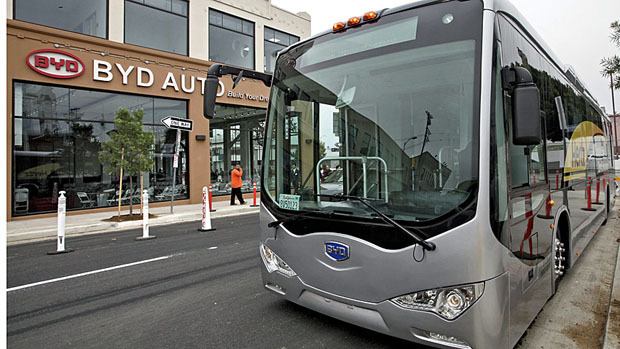 Though all of BYD’s accounts are in Asia and Europe, Proterra is currently operating in multiple American cities including Pomona, Stockton and Tallahassee, Florida. Also, because BYD’s stateside manufacturing is not anticipated to begin until 2014, it is unclear how they will meet the guidelines for the grant under which the project is operating, which requires an American company to manufacture and deliver the buses. The buses chosen will be deployed on pilot routes beginning with Downtown’s Passport, chosen due to its less-than-30-mile route, the capability of the route’s entire line being electric, and a convenient built-in 10 minute charging stop at the Queen Mary. Though the Board was anticipated to vote at their monthly meeting in Febuary, they withheld their vote and scheduled an additional meeting that included a public comment session on March 8. Friday’s meeting will be the last before the board brings the vote to its March meeting next Monday. LBT Board Study Session will be held Friday at 1PM at 6860 Cherry Ave.
To read through the entire recommendation given by LBT staff, scroll below.